TOYOTA BECOMES OFFICIAL COMIC RELIEF PARTNER & HOWARDS HAVE PLENTY PLANNED! 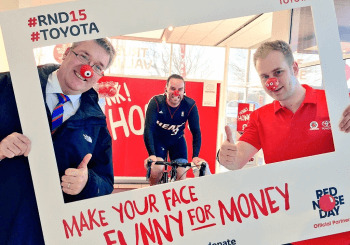 As this year’s Comic Relief Red Nose Day is officially sponsored by Toyota our very own Weston-super-Mare dealership is right at the forefront with their fundraising activities, ranging from cycling to baking! Challenged with raising £1million across the UK, Toyota have enlisted the help of all their employees and network dealerships to support this ambitious goal, with Howards Toyota getting involved with a whole host of activities. Every Wednesday for 6 whole weeks the team are cycling the equivalent of Lands End to John O’Groats without ever having to leave the Weston showroom! Starting at 8am and finishing around 6pm they will cover the near 900 miles to help reach the dealership’s target, set at £2750. Aiming to hit around £180 miles a day, follow the team on Twitter as they cover the length of the British Isles! To help contribute to this tally, each Friday the team will also be organising a “bakeoff” with employees bringing in their own cakes from home to help hit the fundraising target (perfect for those with a sweet tooth!) Also, Toyota UK are the exclusive retailer of the car red nose (modelled beautifully below by the new Toyota Aygo), which are available for only £5 from our Toyota dealership (with all proceeds going to Comic Relief). You can also show your support and raise money through “Make Your Face Funny For Money”, the ultimate selfie in support of Red Nose Day 2015! For more information, you can keep up to date with the team’s progress at our Howards Toyota Twitter, Howards Motor Group Twitter or get involved by visiting the dealership. You can donate online at our Just Giving page, the Red Nose Sponsorship page or alternatively Text TOYO92 with your donation amount to 70700 (i.e TOYO92£10 for a £10 donation). Originating in 1988, Red Nose Day fundraising for Comic Relief has been inspiring the UK to help change the lives of people both in the UK and Africa who are in real hardship. With an international vision to free the world from poverty, the challenge is on to keep raising funds for this worthy cause.